I don't think I have ever had an English teacake...they look simply lovely! 86 the tea but push my bagel button, this does sound charming. Cozy cottage and fireplace crackling away does it for me. Also slathering scads of butter on toasted surface is in my wheelhouse. But the ultimate element(s) give the nod to Scotland. Yup, marshmallow and chocolate. If that isn’t an argument for Scotch supremacy, I don’t know what is. Thanks, Angie. You really must try them! They're quite easy to make. No, Sully, no, to the chocolate and marshmallow! Glad you appreciate the slathering of the toasted surface. agree with Thomas "Sully" Sullivan who posted above!!! Hummm!Your post looks wonderful!Delicious and inviting!Hugs,dear Jean! Beth, I hope you will. And do let me know how they turned out for you! Thank you, Maristella. And hugs to you! Thanks, Su! I like to make English muffins too. Anything in the bread department! I was just looking at a tea cake recipe I haven't made for awile...thanks for the prompt. I think your recipe is pretty similar to mine. Just a family tradition I haven't been doing. Guess it's time! Thanks for linking to Tuesday Cuppa Tea! Ruth, yes, it's time! We must keep up those family food traditions! Not a bad effort Jean. Yes, real butter. Nothing else. Oh ! and and of course, toasted. Sultanas or raisins are good. Sultanas are best I think Jean. Your tea cakes look lovely, Jean. I've never had the pleasure of eating one although they do sound much like spicy English muffins with currants and slathered with butter. I did make the tuna melts, or tuna rolls, which is what I have always called them. They are so much nicer on the toasted English muffins and I sprinkled the cheese on top instead of folding the usual chunks of cheese into the mixture. They were very good and this is how I will make them from now on. :-) Have a lovely weekend. I usually have muffins in the freeze ready for when I'm on the go in the mornings but these look delicious and would be a nice alternative and with probably less sugar too! Yes please, I'd love to try a toasted tea cake, Jean! I have a bagel setting on my Breville toaster/oven, and I'd happily enjoy one. Thanks for sharing the recipe that I'll try soon! They kind of look like little hot cross buns. Thanks, Tony. I like the currants better than sultanas or raisins in teacakes and scones because currants are a lot smaller. Thanks, Sandi. And I'm glad you like the tuna melts with cheese on top! I *am* geared up for a lovely weekend, since I get my stitches out tomorrow. Thanks, Richard. Yes, I'm all for anything that has less sugar! Mildred, thank you. You should make a batch soon. They come together very quickly and don't require any special equipment. Kitty, I think they probably are a bit like hot cross buns, only these are mashed flatter and have no frosting. I hope you'll try them! I've never tried toasted teacakes. I also didn't realized that toaster ovens come with a bagel setting?!? The Margaret tea was from January 2015! It came in a sealed bag inside the tin so when I finally opened it 3 years (!!!) later, the tea still tasted good to me. HA! Margie, I'm glad your tea was sealed well. It would've been a bummer to finally open it and find it stale. I don't know about bagel settings on toaster ovens. I was referring to my little 2-slice pop-up toaster. If I were going to toast more than one teacake (2 halves), I'd use the broiler feature of my toaster oven. Zaa, thank you! And, yes, my hand is better. I'll be able to knead with *both* hands next time! I think you would really have fun making these. :D Cheryl, thank you. "Generously buttered" always gets me, too! I love the sound of your teacakes, Jean! 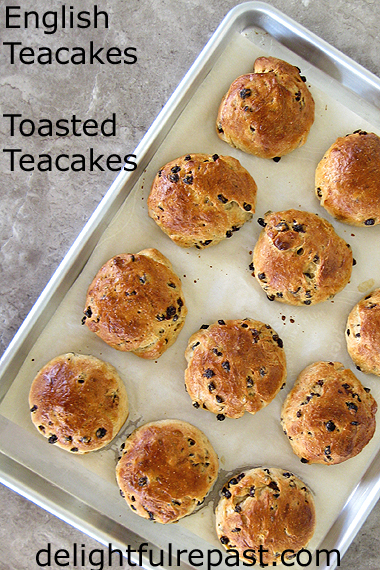 With a fresh container of currants on hand, these just might be our Sunday treat for elevenses! Thanks, David! We love them. Hope you will too. My fresh container of organic currants was labeled by my local natural food store as "currents" - wondered if I should correct them! This look so good and I'm wishing I had one right now with my cup of tea! Thanks, Cathy. Finished the last one yesterday afternoon. Must make another batch! Thank you, Anne. I love them, too! The huge ones might be a little easier to get out of the toaster, but I prefer to make them this daintier size. I'm getting out the baking tools right now.... sounds so good. I can't wait to make these teacakes!! They look so good and would be a perfect treat in the afternoon with my tea. I'm pinning so I can make the cakes when we get home. Mrs Shoes, let me know how you like them. What's not to love about bread, right? Marisa, do let me know how they turn out for you. They are soooo good with that afternoon cup of tea! Leticia, thank you so much. I'm having that cup of tea right this minute! Jean, I absolutely adore a toasted teacake, especially mid morning. They're one of my go-to treats when out and about in England. And happily, widely available in cafes and so on. Thank you for this wonderful reminder. Pauline, I thought you might be a fellow toasted teacake fan! Not many places to get them *here*! Perfect with a cup of tea and always spread butter on them! Thanks, Jan. Yes, balance out the carbs with lots of good butter! They look delicious & a perfect pairing for afternoon tea! Hi Jean! Due to some health issues with my dear mom I have been absent and have certainly missed my visits with you. When it comes to bread, I'm all in. Looks yummy. 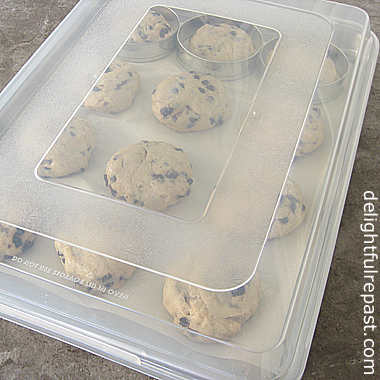 Thanks for sharing in the To Grandma's House We Go DIY, Crafts, Recipes and More Link party! Hope to see you again next week! So sorry about your mom, Debbie. It's so hard, I know. I hope the toasted teacakes turn out beautifully for you. Do let me know! I have had a rethink Jean. What you have made are current buns. Of course current buns should have currents in them. Do you have hot cross buns in the States? I think they are a British thing. They were banned by the Puritans in the 1600s because of their Roman Catholic connections. They are very popular nowadays. IT is an Easter thing. All the shops have Hot Cross buns for sale right now. I toasted two for my breakfast today. There is a fossilized hot cross bun in the Tudor House Museum in Southampton. It was confiscated off the Mayflower. Somebody among the Pilgrims was a naughty boy or girl.Ha! Ha! Tony, yes, hot cross buns are very popular in the US, but I don't make them (Mayflower Puritans on my paternal grandfather's side). They are rounder than toasted teacakes. Teacakes are always smooshed down a bit. Also, they may be more of a Northern than Southern thing, and my English relatives came from the Lake District and other parts of the north. Except for my line that came over on the Mayflower; they were from the south. I must share with you that I couldn't wait until this coming week to try your recipe, just had to make these yesterday and oh my...So delicious! You are so right, lots of butter, yummy! Thank you again for sharing this recipe. Thank you also for your sweet visit and precious comment, is always a joy having you. Oh, Debbie, thank you so much! I'm glad you enjoyed them. I'm making them again soon. I'm going to test how well they freeze, too. I've never heard of English Tea Cakes before. They look delicious! 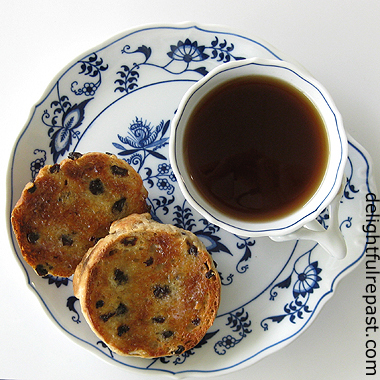 We really do love our teacakes over here in England, Jean, and homemade are the very best. Your recipe sounds delicious! Thank you so much for sharing it, and for being a part of the Hearth and Soul Link Party. Sharing on Twitter and on the H&S Facebook page. Have a lovely Easter week! Thank you, Amy. Hope you'll try them. Sara, thank you so much! Do let me know how they turn out for you. Of course, Jean, if you had made current buns you could develop some rhymimg slang. Think of all the words that end in the same sound as ,"bun." Words like sun, son, done, begun and so on. I am sure you get the idea. If you have a son, you may well do, you could greet him with, " How are things today me old ,"current bun?" Or, if the sun is shining , you could say, "Core, the ,"current bun," is a bit 'ot today." The apostrophe for the h in hot is to emphasise the cockney accent. "Core, " is a Cockney word developed in the Middle Ages. It is a religious slang word referring to the Sacred Heart of Jesus. Well, I must finish now. I think I am ,"current bun." The things you inspire Jean!!!! Cor blimey, Tony, but I hadn't even thought about Cockney rhyming slang! You're right on top of things! Thank you, Marilyn. You've probably noticed that all my food is tea food! Thank you, Alice. And you can use this recipe for your hot cross buns; just leave them round instead of flattening them. I've had thee, but never made them. Now that I have your recipe, I have no excuse not to make them, do I? :-) Good stuff -- thanks. Thanks, John. No excuse whatsoever! I actually happen to have some 'mixed spice' from the last batch of teacakes I made (some time ago, though). These look delicious! Thanks, Judy! You know how I love all things English (*and* all things bread)! These look so yummy Jean! I have never made an English teacake before. Thanks for sharing with SYC. Jann, thank you! Hugs to you. Perfectly timed for Easter - I enjoyed one just yesterday! Thanks for sharing with #TriumphantTales. Jaki, just one?! :-) Have a wonderful week! Those look so good! Thanks for sharing with us at the To Grandma's house we go link party! Thanks, Grandma's House! Wish I had one right now! This looks like my kind of recipe... the type that would make me gain 5 pounds in a week because I would eat them all... all day! Great recipe and photos, Jean! Julie, thank you. I hope you'll try them and love them as much as we do!